When most Americans traveled either by foot or by canoe, the most common and most practical sidearm and camp tool was the tomahawk. The preferred weapon of Native America caught on quickly among the European pioneers, and the combined demand created a massive influx of trade axes to the Americas. Some were of excellent quality and some were only created for profit, with hollow pipe stem handles and pipe bowls instead of polls. Few pipe axes kept the fragile bowl intact for long. The more practical forms of the one-hand axe proved best for work and for survival in the dense brush and virgin forests of the New World. 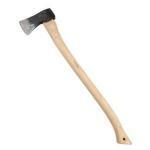 For campers, hunters and canoers today the hatchet or camp axe is still the sensible solution to many everyday problems. Tasks which would take hours with a belt knife take minutes with a good hatchet. 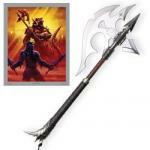 Hunters of big game use the axe to cleave bone. 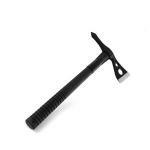 Expert campers use axes to build emergency shelters, and chop and split firewood. Full sized axes may be better suited to farm work, but hatchets and tomahawks go anywhere — small enough to fit in the pack or lash to the bottom of a canoe seat. Sporting axes today include another popular European import, the mountaineer’s ice axe, and military tomahawks which serve peaceful purposes equally well. 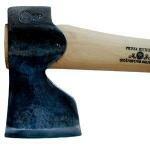 The pipe axe also survives — today as in the old days usually a cheap souvenir. 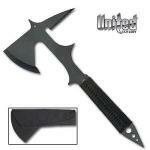 Our choice for the best axe is the Emerson CQC-T Tactical Tomahawk. 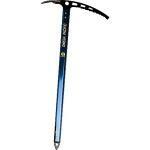 It’s top quality, designed to handle anything from camp chores to combat. 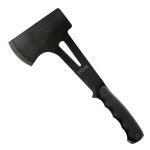 Smith & Wesson’s Bullseye Hatchet provides an inexpensive alternative that’s still practical and reliable. 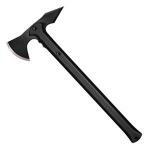 Cold Steel’s Throwing Tomahawk combines a functional hammer poll with an axe blade, and is tough enough for throwing practice. 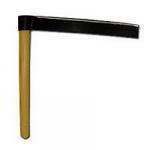 The Premium Single Bit Michigan Axe is the top-of-the-line axe for Ames with a polished axehead and a high-tech, wavy fiberglass handle. Though it's guaranteed for life, you'll still need to take good care of it. 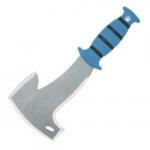 The Truper "Do-It" Michigan Pattern axe is what most people see in their imagination when someone says "chopping axe." This old axe pattern was a favorite on the wagon trains, which were filled with people who knew only a little about frontier life. Estwing solved the ancient riddle of how to make an axe handle that won't break by forging the entire tool from steel. 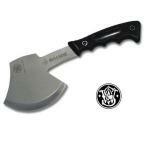 The Estwing Sportsman's Hatchet brings the durability of a fine steel-shanked carpenter's hammer to the campsite in this 16-inch-long and nearly 2-1/2-pound camping tool. Whether you're trying to break into the Professional Lumberjack circuit or want an excellent tool for the homestead, the Lumberjack Competition Axe from ProChainsaw is the right choice. At 5.4 pounds it may seem heavy -- if all you've ever used before is an ordinary hardware store version. Those are toys. This is the real thing. 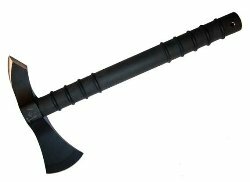 Ever had the urge to own an axe that had a more "modern" feel to it? 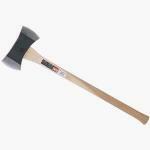 Then this is your utility axe, hands-down. 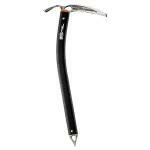 Condor's Wilderness Tool provides all the functionality that you need from a double-bladed axe without looking embarrassingly ancient.